Suan, a 10-year-old male English springer spaniel, is looking for a new home upon his retirement after eight years of service as a rescue dog. 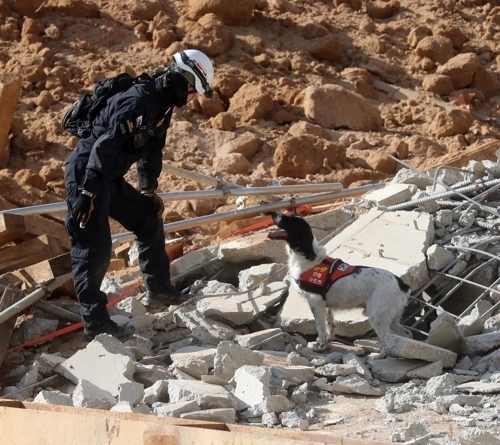 Deployed to Gyeonggi Northern Fire and Disaster Headquarters in 2010, Suan had specialized in finding missing people at the scene of building collapses and mountainous regions. He was dispatched to 197 rescue operations and saved six lives in the process. The canine is retiring due to old age. The headquarters has put Suan up for adoption, in search of a family for the dog. Citizens can apply to adopt Suan at the organization’s website until Monday. Applicants must abide by the Animal Protection Act and provide a safe and healthy environment for the dog. The organization will select Suan’s new family by Jan. 16 after screening applications.